A trumpeter in the British Indian Army who was born in the village of Sarih in the district of Jalandhar, East Punjab. He joined the 32nd Lancers and was shot and killed during the Battle of Istabulat in Mesopotamia on 22 April 1917. His story is told by his great-granddaughter, Citizen Historian Manny Kaur Taylor. Sham Singh was born in the village of Sarih, Nakodar, in the district of Jalandhar, East Punjab. His father, Maya Singh, was a strict Sikh, as were the rest of his family. Sham Singh and his brother, Labh Singh, both enlisted in the same regiment, the 32nd Lancers, but the exact date, and why this particular regiment, are unknown. There is no known military tradition within the family. Despite there being no musical tradition in the family, Sham Singh was a trumpeter in the regiment. The 32nd Lancers went to Mesopotamia in late 1916, and they were among the first troops fighting with the Allies who entered Baghdad. The Samarrah Campaign was launched by the British and their allies in March 1917 with 45,000 troops flung into the battle. During the Battle of Istabulat (in what is modern-day Iraq), Sham Singh was shot and killed on 22 April 1917. According to family tradition, Sham Singh was shot while blowing his trumpet – whether to encourage the soldiers to attack, regroup or retreat is unknown. Sham Singh is commemorated on the Basra Memorial on panels 44 and 65. After his death, Sham Singh’s widow Inder Kaur received a touching letter from Lady Frances Chelmsford, the wife of the then Viceroy of India (1916-21), as a representative of Queen Mary. 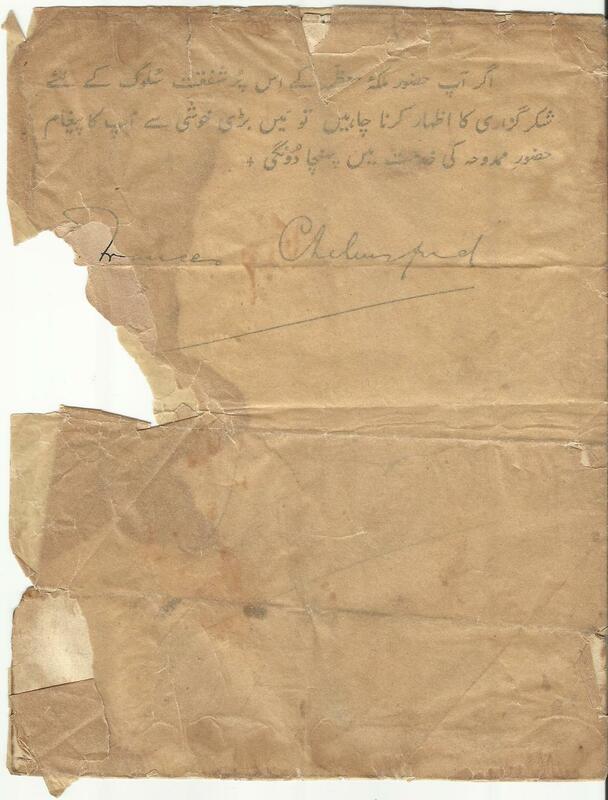 The letter, which was written in Urdu (see image), notified Inder Kaur of her husband’s death and offered condolences. The news I heard about your husband is very painful. The Queen is concerned about his death and because of this I send my condolences on the Queen’s behalf. She herself is also deeply saddened by the news and sends her sorrow. She has sent a picture of [herself to do honour to] a great soldier. All of her sorrow and sadness goes to her sisters in India. India is just like Heaven. She has been twice and really loves India. She has sent a picture of a great soldier who is greatly respected and stands for truth and freedom, who sacrificed his life for you and for me. If you want to thank the Queen for her kindness, I will be happy to send your thanks to her. Sham Singh and Inder Kaur had a son, Dr Baldev Singh, and a daughter, Naraien Kaur. Inder Kaur remarried her late husband's brother Labh Singh, whose wife had died previously. Labh Singh (who became a medical doctor) had four daughters from his first marriage but the two families came together so successfully that none of the children realised they came from different marriages until many years later. Inder Kaur received a 'widow's penny' pension (consisting of small silver coins) from the Indian government. After Inder Kaur remarried, someone in her village reported her to the authorities and her pension was stopped. Being a strong-minded woman and travelled to the local centre of government to object to the withdrawal of her pension. She won her case and returned home in triumph, carrying all her ‘back pay’ in coins in her Punjabi suit. As far as anyone knows, this pension continued until her death in 1976. Sham Singh's son, Dr Baldev Singh, married Gurdev Kaur and they had three children - Dr Joga Singh, Mohinder Singh and Santokh Singh. Dr Joga Singh worked in New Delhi and died in 1989. Mohinder Singh (Manny Kaur Taylor's father) migrated to England via Italy in the late 1950s to work at Dunlop and was sponsored by a family in Leicester. Mohinder’s marriage was arranged in India and his bride-to-be travelled to Nottingham, where her brother had lived since the 1960s, and they were married in Mansfield. Mohinder Singh, now in his 80s, remembers seeing his grandfather's trumpet (which he used to blow into), long uniform coat and medals in the family home when he was young. These items cannot be found now. Santokh Singh still lives in Sarih, which is a smallish community dominated by agriculture. Members of Sham Singh’s family still live in the family home. In the next village, Shanker, is a pharmacy that Dr Baldev Singh ran after training as a doctor. It is still in the family and the current pharmacist is one of Labh Singh’s grandsons (a daughter’s son).